The Spanish parliament has passed an affirmative action law aimed at getting more women into political office, as well as into company boardrooms. The Law of Equality requires political parties to run female candidates in at least 40% of the seats they contest, except in small towns. It includes a measure ordering larger companies to negotiate so-called "equality plans" to promote women. The law also grants 15 days of paternity leave to new fathers. Prime Minister Jose Luis Rodriguez Zapatero said the legislation would do justice to Spanish women and society, which he said would be "changed for the good, radically and forever". "Today is the first day of a different society," he said during the debate in parliament. The law, which comes into effect at the end of March, was supported by all political groups except the main opposition Popular Party, which abstained. Its president, Mariano Rajoy, described the law as unambitious. "I don't believe in the quotas issue: I believe in equality of opportunity, I believe there are many things to be done," he said. "I don't think you can impose quotas on anyone, either on their company boards or anywhere else." The government has complained that women are barely represented at senior levels in the business world. 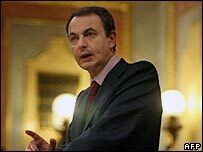 Mr Zapatero, who has included eight women in his 16-member cabinet, has made women's rights and gender equality a key policy aim of his government, which came to power in 2004.